Vivino is the premium stallion and price record holder of the Hanoverian licensing 2018 in Verden. The incredible price of 2.01 million euros topped all previous records on the worldwide stallion licensing and characterizes this young stallion as a champion among all newcomers of the 2019 season. Lots of glamour and charm, combined with explicit masculine expression and flawless exterior make him highly desired. Three outstanding gaits and, as expected, the best rideability are values that complete the overall picture. 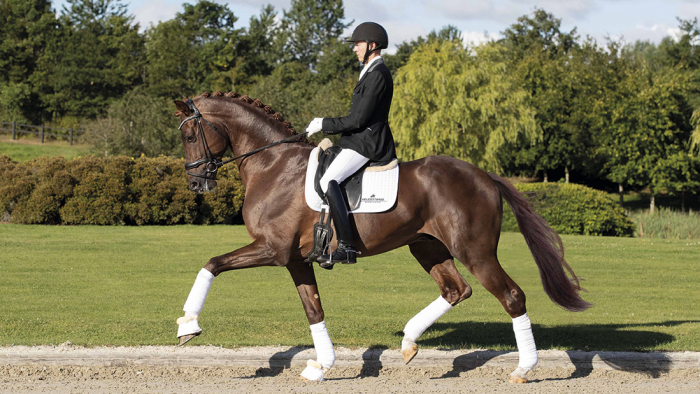 His sire, Vivaldi, was reserve champion at the stallion performance test, won the Pavo Cup in the Netherlands at the age of five and was the winner of the final in the KWPN championship for stallions in 2009. He was internationally successful in dressage under Hans-Peter Minderhoud and has delivered 30 licensed sons in Germany. The dam, Desiree, completed a very good mare performance test and was placed fourth in the premium ring at the Herwart-von-der Decken-Schau 2013. She is a full sister to Die Valentina, who produced a licensed son in 2017 with Livaldi by Livaldon. The grand sire, Dancier, was champion stallion of the Hanoverian licensing in Verden 2004, in 2005 winner of his performance test in Adelheidsdorf, in 2006 Hanoverian vice-riding horse champion and bronze medal winner of the four-year-old stallions at the Bundeschampionship in Warendorf. Later on he was successful up to level-S and delivered over 30 licensed sons, including several price peaks. His offspring are successful dressage horses at Grand Prix-level and are in high demand as auction horses. Vivino is licensed in DWB, OLD, HANN, WESTPH, Süddt. Verbände, Mecklenburg, Rheinland. Vivino is stationed at Helgstrand Dressage.